Eric has been showing up to the Wednesday runs dancing and high fiving people at the end of the run for a long time now. You may recognize him sprinting past you cheering you on, all while carrying a flag. His dedication to training inspired me, especially when I saw his finishing time for his first marathon. You dominated your first marathon, was a marathon always your goal? Yes I had a successful first marathon the 40th Marine Corps Marathon in Washington D.C. My initial goal for running MCM was just to finish, but as I progressed with my training I set a goal of completing it in 4 hours, but all my hard work, training, and healthier nutritional intake allowed me to smash that 4 hour goal and I finished in 3:39:41. Running a full marathon wasn’t a goal I always had I just thought it would be something cool to accomplish as a runner in the future and I wanted my first full to be special and memorable. So when the opportunity for me to participate in the MCM as part of a Veterans Charity Team I took it, nothing more memorable than a Marine running the 40thAnnual MCM. What also helped me in pursuing the full was being around other runners at SR and hearing their stories, it motivated and pushed me to take up the challenge of 26.2 miles. It was also helpful to have a training buddy and fellow Marine, Marced Largo, in my ear planting that seed that I could do it and kill it. Tell me about the most memorable part of that marathon. One of the most memorable parts of the Marathon besides running through the streets of our nation’s capital has to be the Blue Mile, which is roughly mile 12-13, where they display pictures of deceased men and women from our military and volunteers wear blue shirts and hold American Flags to honor our fallen and their families for their sacrifice. It is really moving and motivational. When and how did you find Social Running? 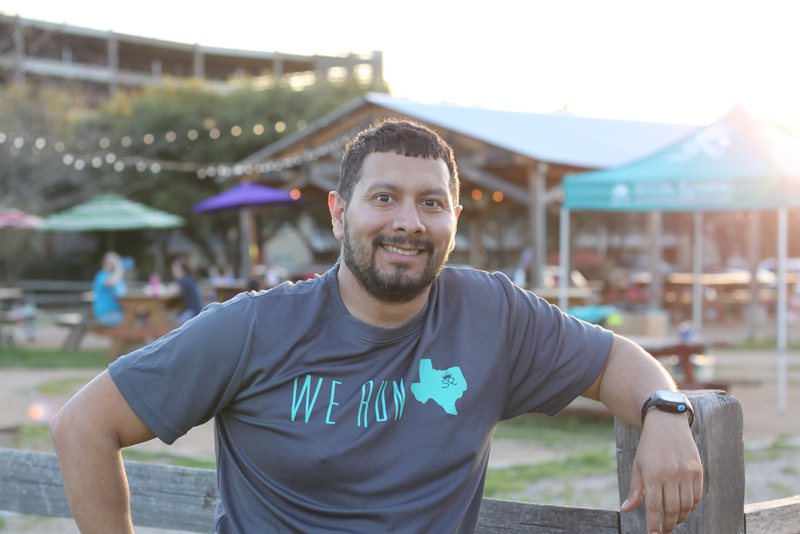 I first heard about social running a few months after I moved to Fort Worth, in early 2014 from a teammate on the co-ed flag football team I was on. She told me about it and I showed up one day and I have been coming ever since. Thanks Linda Mason! When I first got back into running and coming out to Social Running I couldn’t finish the 4 miles without stopping several times and running about a 10 minute mile. As I got my running legs back under me I slowly began to improve and get better to where I could complete the miles without stopping. Hearing about other runner’s goals and accomplishments really motivated me to become a more serious runner and now I’m running in races and pushing myself. Where are you from, and how did you come to be in Fort Worth? I am a Native Texan, I grew up in West Texas in a small town about an hour south of Lubbock. I came to Fort Worth in January of 2014 when I took a position working for Tarrant County Public Health as a Health Educator. Has being a health educator changed how you look at fitness and nutrition? My current role as a health educator is in chronic disease prevention so I educate and inform people on what chronic diseases are and how they can prevent the onset of chronic diseases. Part of my work does affect how I look at nutrition, fitness, and overall health. I like to give personal examples when I teach or educate people this way they know it is something attainable and not just someone talking the talk. I try to be a leader by example, so I practice what I preach. Were you athletic as a kid, did you play any sports? How did you get into running? I was slightly athletic as a kid, I played football and I ran cross country and the 1600 meters or 1 miler in track. I wasn’t the best athlete but it didn’t stop me from participating in sports or athletics. I enjoyed playing sports and being a part of the team. So I have been a runner off and on for a while now. How did you improve while training? Did you add more short runs into your schedule, or just aim to go further without stopping each week? I improved by just running and being consistent. Running with the SR group helped and also running 3 – 4 days per week. I also signed up for a race and having that goal to finish the race without stopping pushed me to keep going each week. I’ve told several people that the only way to get better at running is to run! What did you tell yourself to push through those long training runs? I basically took a Marine mentality and made it my mission to knock out the miles and not stop until they were done. I got myself a marathon training schedule and got after it week after week. Somedays I didn’t want to put in the miles but I just laced up my shoes, got out the door and ground pounded on the trails. I think one of the reasons I got faster was because towards the end of the training and into the longest miles I was ready to be done so I ran at a faster pace to hurry up and get the training miles out of the way. When and why did you join the military? I joined the U.S. Marine Corps so that I could get out of my boring little town due to fact that attending college was not of interest to me at the time. So I joined the Marines to travel and see the US and other places in world. It was a great experience that taught me discipline, organization, and leadership amongst many other skills that have helped me in my life’s journey. Where was your favorite place that you visited? Has military service changed how you approach or work towards your goals? If so, how? Being in the military has come in handy on how I approach training and goals. I make it a mission and I try to stay mission focused making sure I am staying on point with the miles and fueling myself properly for the longer runs. What does being mission focused mean? Being mission focused for me is not letting anything get in my way or sidetrack me from my mission. To accomplish my mission or goal at all cost. So no excuses not to put in the work or the effort or training to accomplish something whether it be running or other life goals. My next goal/s is to continue to maintain my health and running fitness level. As far as running goes I would like to improve my PR in my halfie (half marathon) and get another full marathon under my feet. Another goal is to transition into multi-sport and do a couple of triathlons and maybe a trail race to keep things interesting. A lot of familiar faces attend our weekly free runs, events, and grace the newsfeed of your social media. If you haven’t had the chance to get in depth knowledge of how these runners came to be…well runners, we decided to highlight a few of these faces to get everyone more acquainted and maybe inspire a few unfamiliar faces to attend in person. Who is Amanda Bennett, and from where did she come? I hail from Indiana, the Crossroads of America. I attended Purdue University where I studied Network Engineering Technology, and then I took a job with Lockheed Martin in Orlando, Florida. I lived there until almost 2 years ago when I moved here to Fort Worth, Texas. I started out as a swimmer, actually – a sprint freestyler, to be specific. I grew up in a pool, was quite the little fish. Swimming gave me the benefits of a strong cardiovascular system, but I loathed running. I remember coming in last place at nearly every, if not all, of the cross-country meets, but I let it roll right off my back. I had pretty low expectations of my running performance and was only in it to spend some extra time with my brother. The fact that I didn’t put any pressure on myself was what led me to join the Purdue Triathlon Club. I never would have joined TriClub if I hadn’t done that one season of cross-country. Running my senior year of high school was the birth of my being a runner. When you were coming in last but still running, what motivated you to continue? What did you tell yourself? When I commit to something, I commit to something. I decided I was going to run cross-country my senior year of high school, and I did. I’ll admit, I didn’t give it my all, but I wasn’t in it for performance. In anything else I think coming in last would have really demoralized me, but I wasn’t looking to be a star here – I was looking to have fun. Obviously coming in last isn’t fun, but there’s more to being on a team than how your performance ranks against others. Dedication, commitment, the hope that maybe some of the running would condition me and improve my swimming performance, getting to spend time with my brother – these are the things that motivated me. What did I tell myself? This is a tough question for me to answer. I don’t really self-talk too much – or at least I didn’t for these two athletic ventures. I just go and do. Actually, I vaguely remember telling myself “hey, I finished” after the cross-country meets. For me, finishing a meet was the goal – it didn’t matter how my finishing time compared to anyone. Finishing is finishing. I completed 3 Olympic triathlons my freshman year of college. I was too new to biking and running to do too well, but my goal was to finish and have fun, and that’s just what I did. TriClub tapered off in my sophomore year. Studies also picked up and I found that it was tricky to get to the pool or fit a ride in, so I found myself lacing up and getting out the door for a run. That was when I started to really love running. It was a great break from school, it cleared my mind, gave me solitude, and was easy to make happen. I don’t remember what my first 5K was, but I signed up for a race and loved it. About a year later I was doing road races more and more frequently. At some point in my college career I went home and convinced my mom to join me for a run. Her mom was beginning to develop a pretty severe case of Alzheimer’s, so my mom was eager to exercise, as it is a great way to ward off Alzheimer’s. Man, did she take to running! And then she jumped into triathlon, too! I always say, “I woke up a beast in my mother when I got her into running.” And it’s true. Maybe I woke up a beast of sorts in myself because she and I share a goal of completing a half marathon, full marathon, cycling race, or triathlon in each of the 50 states. Why attempt a race in every state? I did a Study Abroad in Australia my senior year of college. It was a unique experience. I am lucky to have travelled and lived in another country for half a year. Something I realized about myself and even fellow Americans in the USA was that, like Australia, my country is amazing, too. While abroad I made friends with people who asked me if I’d been to Yellowstone or Yosemite or NYC, etc. And I felt silly for having to answer that I hadn’t. It really opened my eyes to what a beautiful and wonderful country the USA is. Shortly after graduating from college is when me and my mom came up with the goal of doing a race in all 50 states. It would be a life-long challenge, something to do with my mom across the distance of living so far apart, and it would afford me the opportunity to experience and see the USA. It’s not really a competition, but I tell myself my mom is “winning” because she’s a new empty-nester. She’s knocked out 15 states; I have 11 under my belt. We like to do as many races together that we can. With my living so far away from home and family, training together virtually and checking in on each other’s workouts and progress has helped to keep us close. One of my favorite half marathons was the Atlanta Half Marathon over Thanksgiving. I lived in Orlando at the time, and so I drove up to Atlanta as my mom flew in. I scooped her up from the airport and we had a fantastic girls’ race weekend. We bought a City Pass and did some fun touristy things, we had dinners and drinks, and enjoyed one another’s company. The race was a hilly course that neither of us was fully prepared for, but we sure did earn our turkeys that year! In September we’ll be doing another rendezvous race. It’ll be a family ordeal: my parents, both of my brothers, and my sister-to-be will be meeting up that weekend! One brother will be in training, but the rest of us will be doing the Las Vegas Twilight Half Marathon! We’re all really excited for this reunion! I’m really proud of my family for being conscious of their health and so physically active! You appear very organized as witnessed from several party planning and Ragnar events, do you approach your training the same way? Haha, this is probably one of the first things people notice about me. I’m not perfect by any means, but I surely am a perfectionist. I get it from my dad. He’s logical, analytical, organized to the bone. He rivals me for my love of tracking and measuring things. And I’ve pretty much always been this way: I remember playing close attention to details and staying well organized ever since realizing education matters and really buckling down back in middle school. I don’t always approach my training with precision planning, but it happens more often than not. Part of the thrill for me is in the planning – scheduling training sessions in my calendar, rounding up friends to workout with, registering and arranging travel and budgets for events. I’m a big believer in planning ahead because I get very frustrated at the thought of “man, I wish I’d…” Planning is my way of avoiding that frustration. But, again, for me it’s fun. I just really enjoy planning. When I found the group on Meetup.com I figured it had to have been around for at least a few years. The group was so active and established – it had so many fun runs, drinking – ahem – social opportunities, and pictures. I’d been struggling in Orlando for years to find a good running group. Social Running was everything I was looking for in fellow pavement pounders. I am not among the super cool who can say they were founding members, but I joined within Social Running’s first year w hen I made the move to Fort Worth in December 2013. Certainly the biggest factor in the move was my career, but Social Running sealed the deal for me. I had to be a part of it. I quickly got involved with the group when I signed up for my first event with them, the 2013 Cowtown Half Marathon, and, in April 2013, my first Ragnar (SoCal). That experience was one I’ll always cherish and love to reminisce. There’s definitely something for everyone, namely the Wednesday social runs. I love lacing up mid-week for those 4 miles along Trinity Trail. In the cooler months I enjoy bringing Heidi, my German Shepherd Dog, with me. Her breed needs a lot of exercise and intellectual stimulation, so the running and socializing is great for her, too. Sometimes she drags but more often than not she’s pulling me along. Almost 6-years-old, but she still has the energy of a young whippersnapper when it comes to Social Running! Was an ultra-marathon just “the next step” or has it been a goal of yours? I suppose my committing to an ultra-marathon was a combination of being the next step and being a goal. Right after I moved to Texas the 2014 Cowtown was held, and I remember the glory that was earned by that year’s ultra-marathoners. That was when I first really started to desire running one myself. A variety of things prevented me from doing the Cowtown Ultra this past February, but next year, baby, it’s happening! The next chapters in my book of running include a sprint triathlon on Labor Day, the aforementioned Las Vegas Half Marathon, Ragnar Trail Hill Country in October, possibly another Thanksgiving Day Half Marathon, and the Cowtown Ultra in February. I’ve agreed to captain the Social Running Cowtown Ultra Team, so if you’re at all interested, let’s chat! …my goal was to finish and have fun, and that’s just what I did. 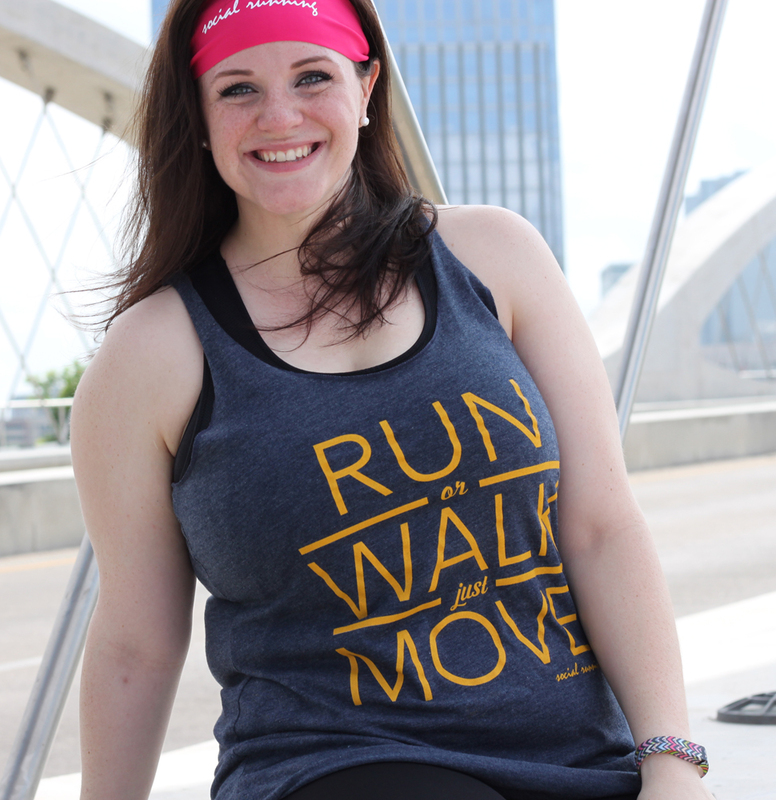 Getting to know Smiling Sarah W.
You may recognize Sarah Waugh modeling some of our SR tanks online, from our Facebook page, or cheering and smiling along the Wednesday route. She also happens to be one of our SR ambassadors and the perfect person to start our interview series. I think everyone has a different story, getting inspired by someone/something to set a goal, or just discovering a passion by accident. Sarah was no different in she wanted a change she could see in herself. A local running club gave her a taste of a journey into fitness, nutrition, and motivating others. Were you athletic or play any sports when you were younger? I was definitely the most UN-athletic kid growing up. I stayed away from team sports and athletics as much as possible. P.E. was torture. Believe it or not, I was kind of shy as a kid! So how did you get into running? My running journey started with lunch at Gloria’s in Montgomery Plaza one Sunday afternoon in late 2013. A friend and I were walking around after lunch and we wandered into Luke’s Locker. I happened to see the sign for their “9 to 5K” training program, so I took a brochure and didn’t think too much about it. Later that week, I decided, on a whim, to sign up for the program. 9 weeks later I was running my first Turkey Trot on Thanksgiving Day. It was hard and I was huffing and puffing (notice this is BEFORE my Weight Watchers journey so I was much heavier). But I finished the run and felt pretty good about it. From November to the next spring I didn’t really keep up with running since I didn’t really like going by myself at that point. Mentioning Weight Watchers, why did you go to your first meeting? That started in March 2014. One of my dearest friends, Naomi, had started going to WW meetings and was having great success, and she finally convinced me to try it out. Even though we are in different cities, we used each other as accountability partners. I enjoyed the social aspect of meetings and the camaraderie, but have since departed from WW. How did that change your perception of fitness, health, etc.? I lost my first 25lbs with WW and am so grateful, I just feel like I “moved on” nutritionally, if that makes sense. I really wanted to focus on clean, whole eating, not just “if it fits in my point allowance, I’ll eat it”. So with that said, I try to keep a “eat clean, train mean” mentality, balancing an 80/20 paleo-ish template. However, I still portion my meals. My perception of health/fitness/wellness has really evolved over the last year. I’ve tried various fitness programs, diets, etc. over the years and this last year is when I found my niche. Eating clean, running, and cross training, as well as trying to live a balanced life (taking control of my stress, sleeping better, etc), has really proven the most effective for me. I believe we all can live a healthy, well balanced life, and it may look different from someone else’s. I used to compare myself to other runners, etc., but once I quit doing that and focused on what makes me happy and healthy….that’s when things really start clicking for me and it became a lifestyle, not a struggle! Did you try to set many goals along the way? I’d say I didn’t really set too many until I was active with SR. My first goal was to attend three SR a month, and workout three other times during the week. I did that by working out at home with various programs like cardio and weight training and PiYo (pilates/yoga/conditioning). I have a crazy schedule and the at-home option works best for me and when I started seeing results from running and those programs, I decided to become a BeachBody coach to help others take the first step and stay motivated! That’s when I started becoming more active on social media. I quit being afraid of what people might think, and just put my story and my journey out there! I thought “if I can touch one person…just one…I will have made a difference. If one person laces up running shoes, pops in a fitness dvd, decides to eat healthier…it’s worth it”. My mission statement is now to inspire everyone to become the happiest, healthiest version of themselves! How did you find SR? Were you nervous to come? In the beginning, I was a little nervous at SR, only because I had the “I’m not a runner” mentality. But no one ever made me feel unwelcome or like I was in the wrong place. Quite the opposite. Everyone was so inviting and encouraged me to come back. It became something I looked forward to weekly! I even ran into my downstairs neighbor, Ashley! We hadn’t really talked too much before SR since we have different schedules, but that day and many, many runs later we are now good friends! I even had a slight melt down when I had to register for a Wednesday night class this upcoming semester (NOOO!). Wednesdays are a Run Day! Thanks for sharing your AWESOME story with us Sarah! I know this was a bit long-winded; I just didn’t want to leave anything out that might be helpful! All in all, SR has been a haven for me. A place where I’ve made some of my best friends, felt invincible, and been encouraged. I just want to share some of that inspiration with others! 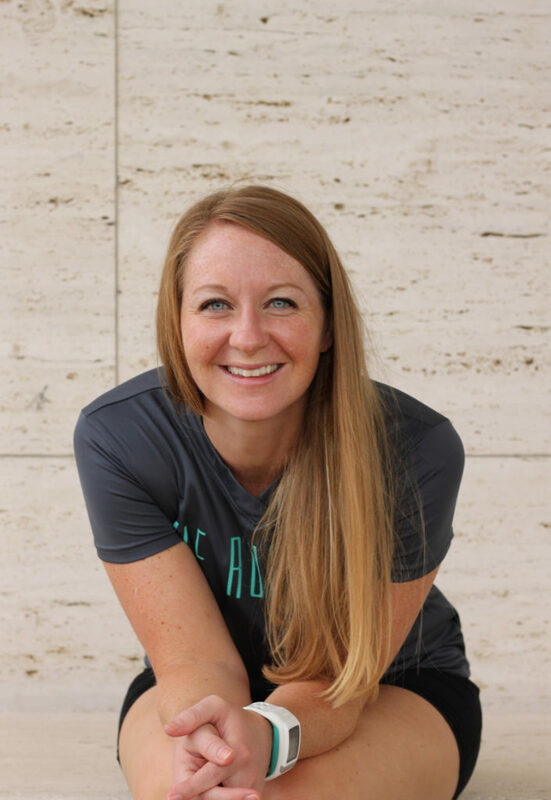 Sarah nervously says that she will next take on a full marathon, “just saying it makes me nervous but I know that I’m surrounded by people that continue to encourage me.” You can find out more about Sarah and follow her journey by attending a Social Run, or checking out her page. “Some days it’s not about how fast you are or the distance you ran but that you committed to get moving.”-Sarah W.
Weight Watchers and BeachBody are copyrights held by their respective owners that Social Running is not affiliated with.